There is a very famous saying by Ernestine Ulmer - "Life is uncertain. Eat dessert first". But sadly that will definitely not be the case for me. I would rather choose any other savory dish as my last meal ;-). Let me give you an example. 26 of Bangalore food bloggers met up for a meet last Saturday. It felt so wonderful to meet and interact with so many of us under one roof. Food was the common point for almost all of our discussions. 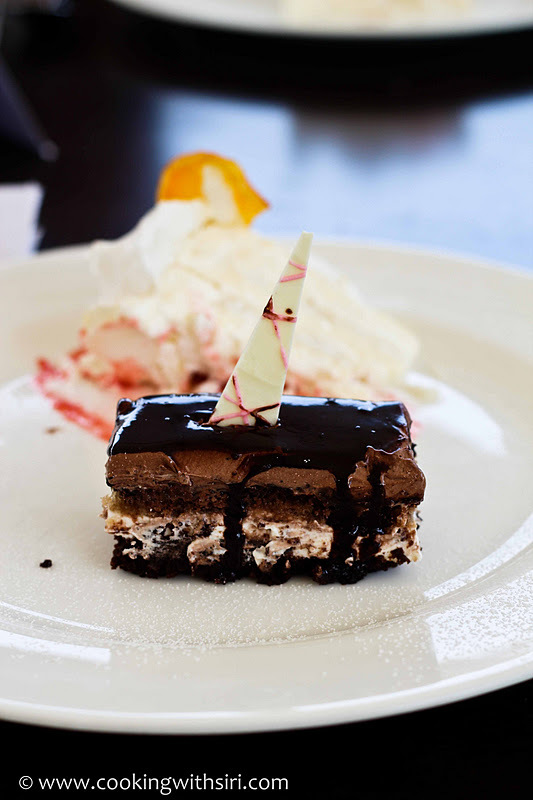 After a trio of appetizers and main course, here is what was served as our dessert - White and dark chocolate lasagna and Lemon meringue with strawberry coulis. Trust me it tastes as wicked as it sounds. I saw so many happy faces around, digging in and some literally licking their spoons. Well, it was me who just couldn't eat more than a spoonful. The lady beside gave me a stern look which said - "You got to be kidding me!". She is one huge chocoholic herself!. What to do? Sugar and me just don't go together. That's the reason, my last dessert recipe was posted way back in August which was a Prune-Almond Phirni. When Anu announced the theme for FSB for October, she asked all of us to cook with foods that we don't really like much or ignore and I could think of only one thing - Dessert. I am great fan of sweets small enough to satisfy one's cravings , like today's recipe - 'Blueberry Yogurt Kanten', a dessert which doesn't call for any fat. Hence no extra calories to be worried about. If something sweet is on your mind for any parties or potlucks, this recipe is a perfect match. Make it the previous day, cover and allow it set in the refrigerator overnight. I am sure you and your guests will love this super-tasty dessert. What is Agar-agar? - a nutrient-rich, high-fiber, no-calorie sea vegetable used to gel desserts. It comes in the form of bar, powdered or as flakes. It is normally recommended to opt for agar-agar flakes as they are easiest to use and dissolve. Kanten, the gelatin-like Japanese dish made with agar agar, is just as refreshing for any time of the year - fall, winter or summer. 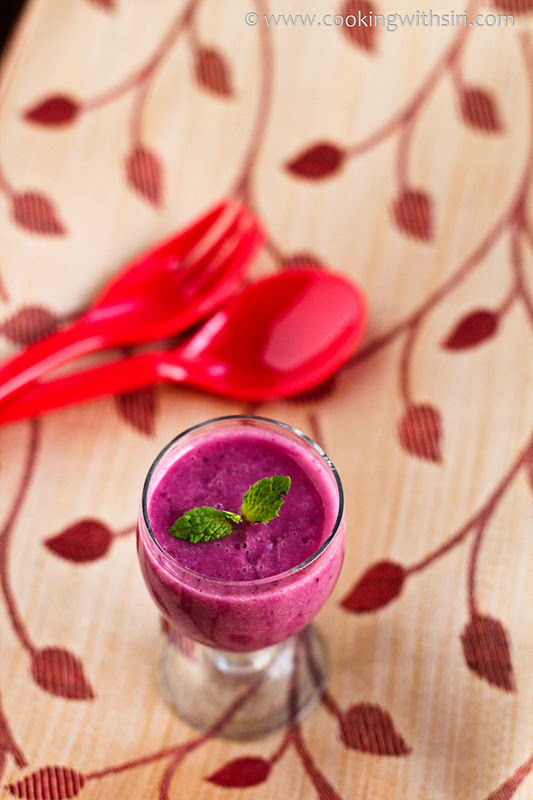 The addition of yogurt make it substantial and gives it a melt-in-mouth feel. Many other flavor combinations can be made into a kanten - cranberry-pear, green tea-kiwi, cherry-apricot, peach-berry etc. the basic recipe remains the same. This is a very forgiving recipe. Feel free to decrease or increase the amount of sugar, juice or agar-agar mentioned. Play around with the amounts until you get the right consistency. A word of caution is that, agar-agar works differently for each brand. It is recommended to closely follow the instructions on the package. Also, the consistency of the pudding is dependent on the texture of the ingredients used. Nonetheless, the tastes beats them all. I am certain you will fall in love with agar-agar once get a hang of how to use it. Read the notes below. Note: I have used normal yogurt for my recipe, hence it is no longer vegan. Original recipe suggests 'Vanilla Soy Yogurt'. 1. In a saucepan, combine blueberry crush, water and agar-agar flakes. Let them soak for 30 minutes. 2. Stir in almond extract and bring the mixture to a simmer on a low heat. Whisk until the agar-agar is completely dissolved. Simmer for 5 more minutes. Note: Donot boil the agar-agar mixture or you will reduce its thickening power. Bring it to a simmer slowly over a low heat & whisk often. 3. Take off the heat and cool to room temperature. 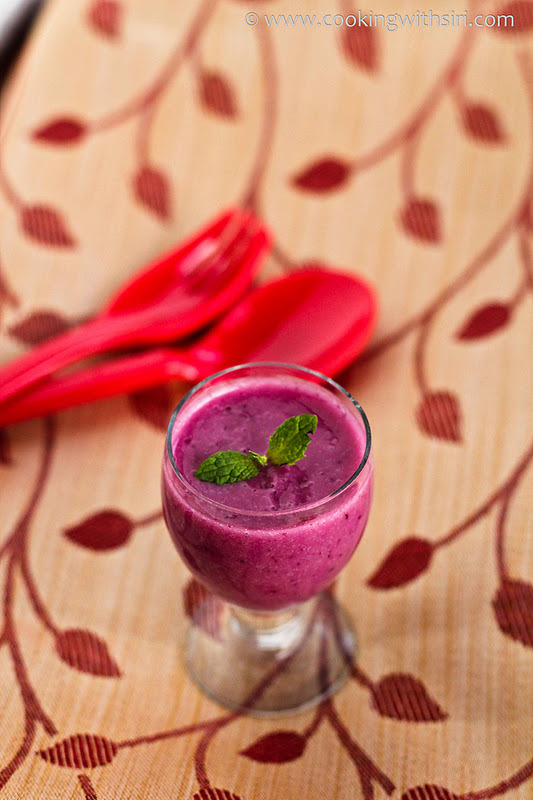 In a blender, mix in yogurt and blueberry mixture and puree until smooth. 4. 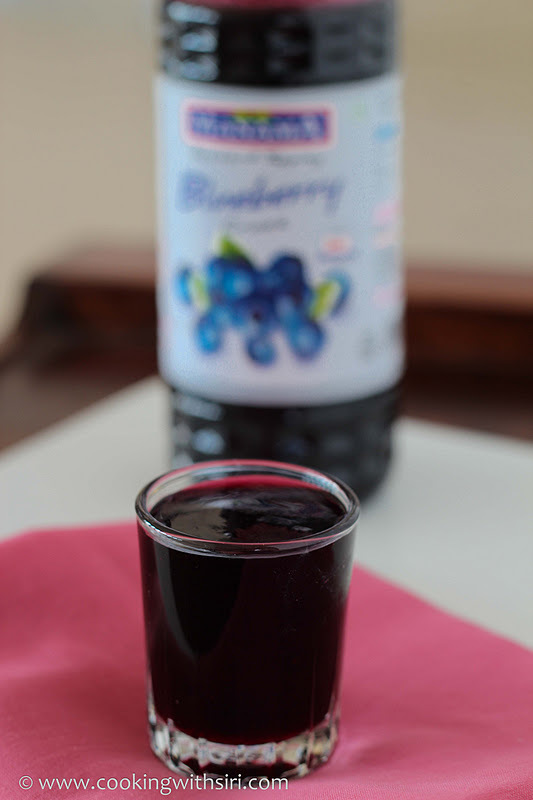 Pour the mixture in shot glasses or small ramekins and refrigerate until set. (atleast few hours). Cover and keep in the refrigerator until serving. 1. If any lemon, orange or lime juices is an ingredient, you may need to increase the amount of agar-agar used as citric acid sometimes retards the agar-agar's ability to congeal. 2. It is always safest to test the kanten before removing it from the stove. Put a spoonful of kanten in the refrigerator for about 15 mins. If the kanten excessively hard, liquid can be added. If it is too soft, dissolve a small amout of agar-agar in juice, cook it and add to the rest of the ingredients. Both yoghurt and blue berries are separately my favs....I have never had a kanten though, nor have cooked agar-agar. I loved that cup filled with a beautiful coloured and flavour filled kanten! Love the color and the drink !!! Lovely color Siri. Glad you girls had a lovely blogger's meet! Hey wow I have one packet of agar agar and will use it. Thanks. Good to know that you all had a gala time. The dessert part sounded tricky there. I would have just gulped it siri :) Blueberry yogurt kanten is succulent. i just love the colour of that dessert! And what awesome clicks! Im sure it was yummy! Beautiful dessert! I have a huge sweet tooth but i tend to hold back as much as possible for the calorie reasons ;) this recipe is perfect! DO you think I can send my 'Pumpkin Salad'(just posted yesterday) to your event? How can you not like sweets Siri. That too chocolate? I mean just HOW?!? Coming to this kanten, it looks really refreshing. I've never come across anything like this...or even heard about it before. You're certainly knocking new doors with your food blog. Love it and gotta give this it a try.